Familiar Joy: A peek into our home--CLOSET editon. A peek into our home--CLOSET editon. Alright, peeking into my closet isn't exactly the most exciting thing you'll ever see. And if I'm being completely honest, it's not super organized right now. 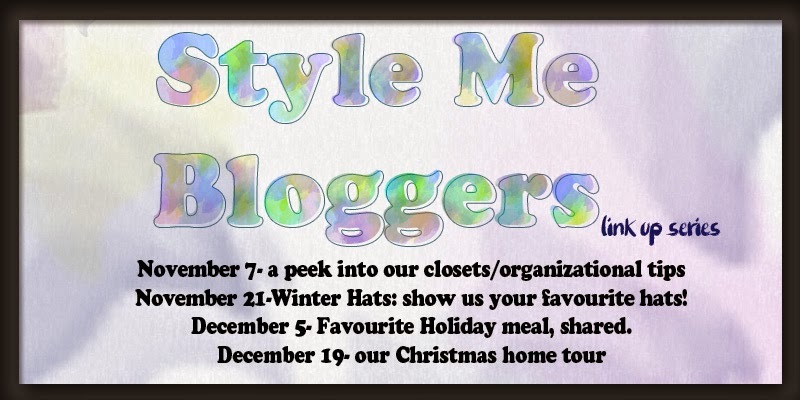 But for the sake of this blog post, and the fact that I'm linking up with all these fabulous bloggers I met through the Style Challenge, I wanted to get the pictures taken. 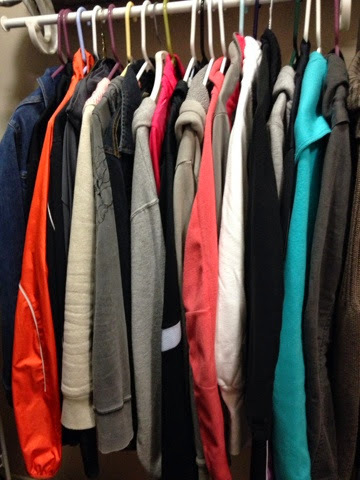 I have a few tips for keeping the closet organized. I've actually tried several different methods and landed on the one I'm using now, which seems to work the best for me. 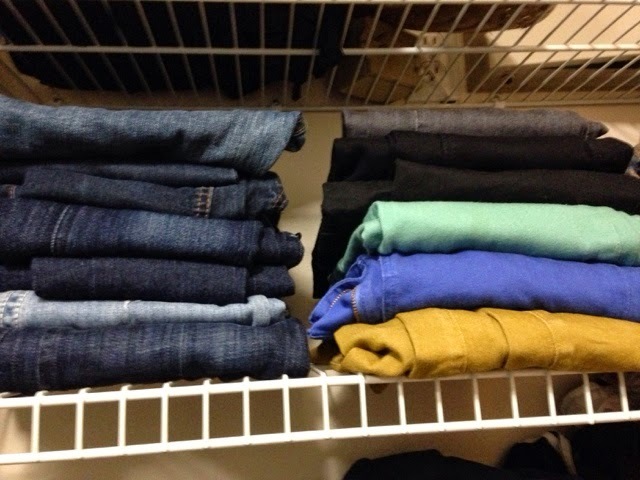 For now, I organize my tops by type. In the past, I organized by color, but it drove me bonkers when I was looking for a cardigan and I had to dig through 14189639 tops to find it. Now, I go to my cardigan section and there are about 10 choices. Super easy! It's impossible to take a picture of some of the spaces in my closet without cutting things off because of the way the door sits and the angle of the walls. The picture below shows the lower left rack in my closet. 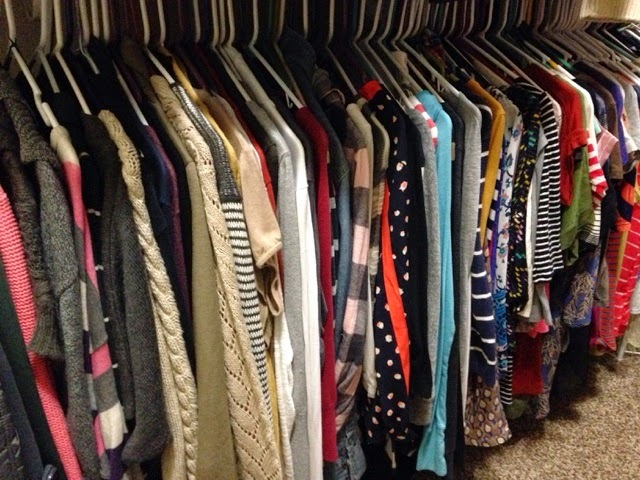 I have sweaters on the far left, then cardigans, long sleeved tops, short sleeved and tanks. I suppose I could organize further with blouses, hooded, plaid, dressy, etc, but that's a whole lot of work and uneeded stress. 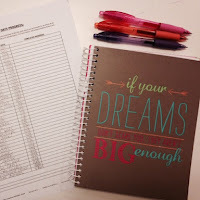 Do what you have time for! I should also add that there is an identical length clothing rod above this one and that's where hubby hangs all of his shirts and sweaters. We decided he gets top because he's taller! 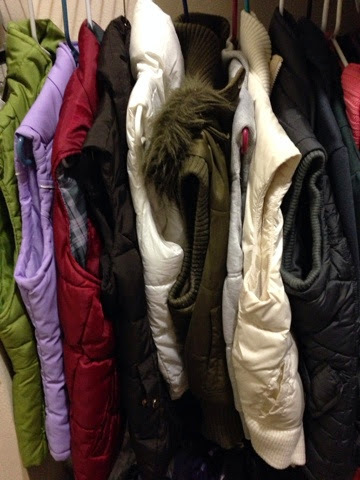 On the far lower left rack, I have my puffer vests, which are hidden by the door if it's open. I chose this spot because I don't need easy access to these most of the time. I have some cool built in shelving on the right of my closet, and although these shelves were most likely designed for shoes, I use the bottom 3 for my scarves. I'm not sure I will leave them here forever, but I like quick access (because I wear them ALL the time) and I can see them all this way! Above the scarf shelf, I have 3 more shelves that I use for jeans, shorts, t-shirts, tank tops, workout thanks and pants. These are all folded into separate piles. Next to the scarf shelf on the right, I have my dress pants hanging. Along with my dresses and skirts. 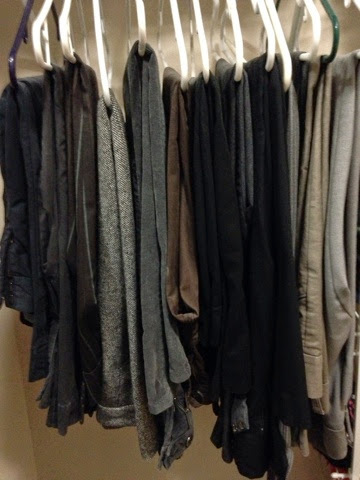 Above this clothing rack is where Adam keeps all of his folded pants, sweatshirts and sweaters. 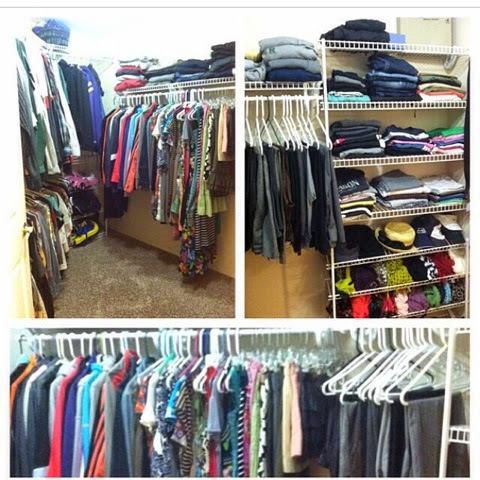 And to give you an idea of how all of this fits together, here are a few pics of the entire closet. It's very large. In fact, we could have probably used it as a nursery, if we had needed the space. I really love having a master closet off of my master bath, so it keeps the messy clothes piles out of our bedroom. Which happens to be a huge pet peeve of mine. Sorry, honey! ;-) I guess if I were designing my dream closet, I'd love a bench in the center and a huge full length mirror for trying on clothes. Otherwise, I'm happy with our space. It definitely works for us! Shoes are a whole different story and post. You may be surprised with what we do with those!! 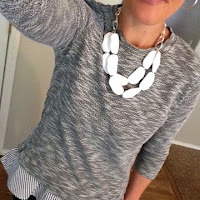 This post is linked up with all of the fun ladies from the style challenge. 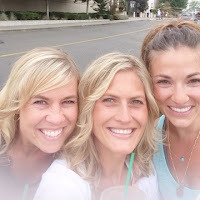 I hope you are able to check out their blogs, too!! 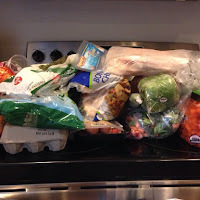 Link up and join us if you'd like! wow!!! I'm in awe of your vest and scarf collections! Amazing!! Not fair. Your closet is huge.... And organized! Well, I picked it up for the picture! It doesn't always look like this. Oh my, that puffer collection is awesome! I'm adding you to my list of closet envy. Love your scarf collection! Thanks, Lana! I've acquired them over many, many years. I love scarves year round! Love this!! Envious of all your puffers! Love the lavender one! Great closet!! Wow you have a whole vest collection there! lol I think I'm going to copy your jean storage idea! Yep, I did! 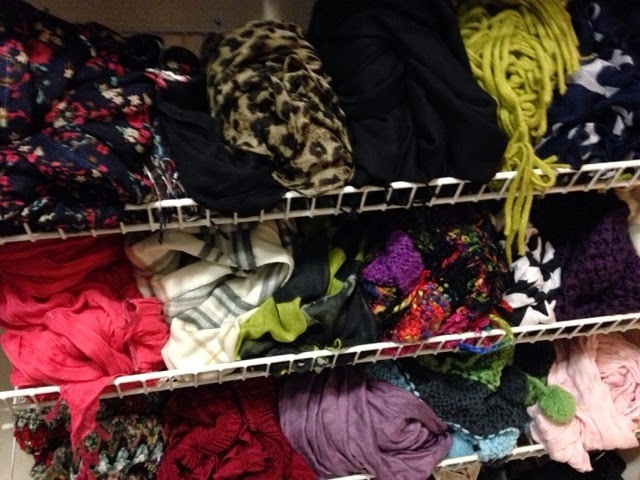 I stole your scarf idea and now mine are neatly folded on a shelf in my closet. :) Thank you! Yay! Let me know what you think! I've toyed with the idea of doing some sort of hanging method, but the ease of seeing them on shelves is hard to let go of! I am quite envious of your scarf and vest collection! You have a lot of choices. 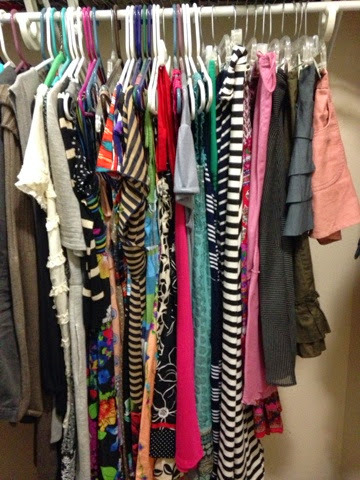 Thanks for sharing pics of your closet.